If the Pioneer Woman makes it, it is bound to be absolutely delicious! I was skimming her website for new dinner ideas and came across this recipe. 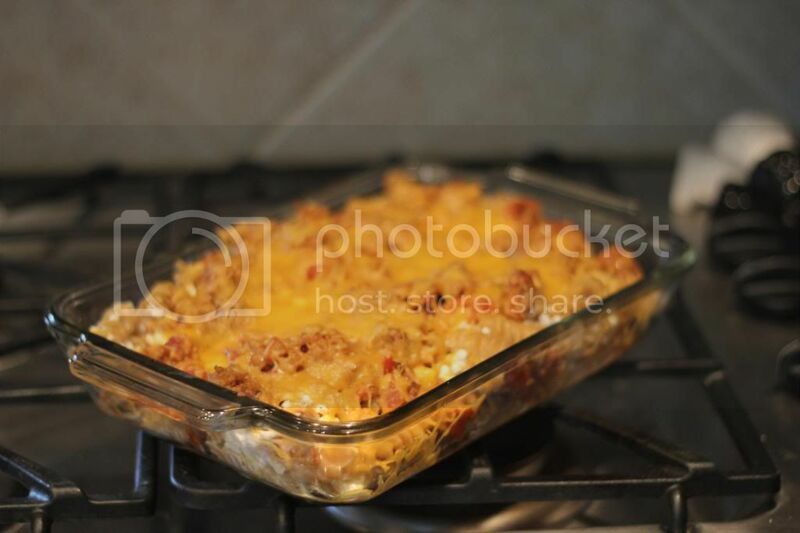 It caught my eye because I love casserole-type dinners and the fact that it is made with cottage cheese just makes my protein loving husband happy! I have to say that the leftovers were even better then the first day we ate it and I was sad when I ate the last serving! 1. Brown meat in a large pan. Drain excess fat and stir in the tomato sauce. Stir in salt and pepper to taste. 2. Meanwhile, cook noodles according to package. 3. In a medium bowl, mix together the sour cream, cottage cheese, and plenty of black pepper. Add in noodles and green onions. 4. Cover the bottom of a full sized baking dish with tomato sauce juice (not meat) or spray with cooking spray to prevent sticking. 5. Pour half of the noodle mixture into the pan. Top with half of the meat mixture and 1/2 cup shredded cheese. Repeat with second half of ingredients. 6. Bake at 350 degrees for 20 minutes. 7. Enjoy!